This expansion-pdf for Rite Publishing’s phenomenal „Play VTM-style vampires in PFRPG“-toolkit „In the Company of Vampires“ clocks in at 12 pages, 1 page front cover, 1 page editorial, 1 page SRD, 1 page advertisement, leaving us with 8 pages of content, so let’s take a look! This review was moved up in my reviewing queue at the request of my patreons. Okay, so this was already pretty cool…now let’s take a look at the items! The first would be the blood doll – these effigies come in 5 variants and act as a painless means to donate blood…and temporarily store it. While the stored blood slowly dissipates, these dolls should provide a colossal boon for vampires embarking into lifeless environments. Big plus! Blood staves come in 6 variants – these staves can be used by vampires employing blood magic to 1/day per spell level, reduce the cruor cost of blood magic employed. Nice. Elixirs of lineage are really cool: Basically, this liquid acts as a vampire Litmus test – drop a blood inside and you’ll see color-changes depending on lineage. I love this item. It feels incredibly right for vampiric nobles obsessed with the purity of their bloodline…and can make for some really cool infiltration complications. But we move even further past simple items, as the pdf introduces the item category raiment of the ancients – it should be noted that this entry contains discrepancies between the truths of moroi myth and what was elaborated upon in the account given by sovereign Evelyn Arlstead in ItC: Vampires – this is intentional and should be considered to be a mild potential SPOILER-warning. These items are rare, valuable and can only be properly crafted by vampires; they require components taken from vanquished elders; it takes a vanquished elder or ancient vampire to provide sufficiently powerful components. The astute reader will realize at this point that the respective raiments are basically the proof and in-game justification that is analogue to the defeat of the antediluvians in VtM, though, taking the system’s peculiarities into account, the narrative takes on a different turn beyond the impending doom of their return, setting the moroi more clearly apart. It should also be noted that these items have different benefits for vampires and other beings that are not of the respective, associated bloodline. It should also be noted that partial mitigation of the respective curse is part of the items, further enforcing their special place within the context of the moroi. In case you haven’t noticed – these are basically the most sought-after items of the race and could be defined as almost-artifacts…depending on the power-level of your campaign and considering the genesis of the items, they may well be considered to be such, though crafting costs etc. are provided, should your PCs manage to defeat such an elder vampire. As a huge fan of making items out of vanquished foes in RPGs, I applaud this notion. It just makes magic feel more magical. Grisly Fetish bracelets of the nosferatu allow vampires to suppress their curse and better conceal themselves. Heart’s blood is a special magic weapon property (+2 or +4) that allows for particularly potent attack-deflection – the ancient one is borderline insane and allows for Reflex saves to deflect any attack (not an action), with only enhancement bonus modifying the roll. Usually, I’d be screaming hellfire and brimstone right now, but considering the requirements, that the item will not be for sale (unless you’re playing a WEIRD campaign) and its implications, I consider it frankly to be closer to an artifact than to a regular weapon and will let it stand. If you dish out these items like candy, you probably expected a brutal power-surge. Well, obliged. Memorial tomes of the warlock bloodline enhance blood magic and also act as a kind of spellbook of sorts for the blood magic engine (which is a more complex rules-operation than you’d expect!) – kudos! The inspired’s relic of betrayal allows the vampires employing them to mitigate the superstition and also fortifies them versus channeling. Minor hiccup: The item is an amulet, but the elder version calls it a ring in a cut-copy-paste remnant. The shade’s secret urn is worn in the belt slot and helps versus sunlight exposure and light, while the sovereign’s shattered crown helps versus the mirror problem…which would be as well a place as any to note that the tales of how the elders were slain make SENSE. They tie into the lore, curses, etc. and add a layer of depth to the items. The nightcaller’s stolen fur allows for indefinite hibernation in the ancient versus and mitigates the homesoil restriction. Now beyond these, the pdf explains some subtleties of the vampire condition and the potent curse that sparked the condition, which make, frankly, for a fantastic backdrop for a whole vampiric campaign. Speaking of which…Raiments actually echo the true, original sin that gave rise to the moroi – and thus, moroi gaining access to multiple raiments can enjoy synergy effects beyond the already potent item effects…the layers of lore woven with a scant few lines are inspiring. Editing and formatting are very good; I noticed no serious issues apart from the somewhat uncharacteristic ring-snafu. Layout adheres to Rite Publishing’s two-column full-color standard. Artworks are nice full-color stock pieces. The pdf comes fully bookmarked, in spite of its brevity. KUDOS! I challenge you to find better wrought crunch and lore for a single buck. 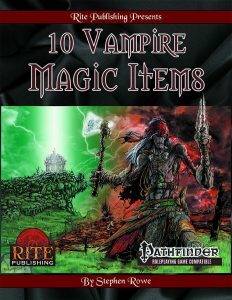 Stephen Rowe is not content with just writing some items; instead, he has crafted a glorious, must-have expansion for “In the Company of Vampires.” The rules for blood crafting alone warrant getting this book; the non-raiment items are great and the raiments OOZE flavor; they can arguably inspire adventures on their own…perhaps even campaigns. The thread of lore is intricately woven through the crunch presented herein, adding a further dimension to the humble pdf. This costs a paltry $0.99. For 8 pages of fantastic, vampiric goodness. Seriously, if you own In the Company of Vampires, then this is pretty much the DEFINITION of “Must-have”. Heck, even if you’re not interested in ItC: Vampires (Why? Beyond the player option, it makes for a rather nifty GM-toolkit, even if you don’t want playable vampires! ), the raiments may very well constitute an excellent reason t get this pdf and its parent-file…the anti-arch-vampire story practically writes itself. Heck, blood crafting has very creepy implications when you ponder the consequences… So yeah. GET THIS. Now! It’s less than a buck! Forgot the rating? Obviously, this is 5 stars + seal of approval. You can get this pdf for a single buck here on OBS! haven’t yet picked up In the Company of Vampires? You can find that book here on OBS! This game clocks in at 102 pages of raw content once you take away ToC, editorial, etc. (101 if you don’t count the index). My review is based on the softcover print edition, fourth printing, 10th revision to be more precise. The book, as usual for OSR-games, is in 6’’ by 9’’/A5-format. This review was requested by my patreons. 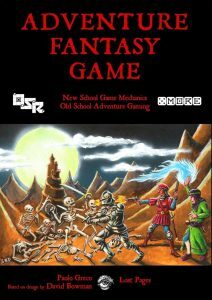 Okay, so Adventure Fantasy Game (AFG) can be considered to be an OSR-game, but it is one that strongly deviates from the roots of the game. The tag-line is “New School Mechanics – Old School Adventure Gaming” – sounds interesting right? Well, the first and most obvious deviation from e.g. Labyrinth Lord, S &W or LotFP would be that this system only employs d6s – it is based on the 5MORE-design of David Bowman. Its goal is to teach roleplaying quick and one of the best components of this book is the organization: Whenever you find yourself looking for rules, the book tells you where to find them. This begins in the introduction and is used to great effect throughout the book – this is easy to use. So, 5MORE is simple: Roll 5+ on a d6 and you have a success. You gain +1 for easy tasks, -1 for hard ones; +1 for good ideas, -1 for bad ones, +1 for high relevant stat, -1 for low relevant stat, +1 for good equipment, -1 for bad equipment. 1 is an absolute failure, 2 – 4 are regular failures. That’s the core of the system. Characters are defined by 3 Stats: Physique (PHY), Craft (CRA) and Spirit (SPI). You roll 3d6 for each, but bad rolls are less important in AFG than in comparable OSR-games. These stats know three grades: All values of 8 or less are low (-1 to 5MORE rolls), all above 13 are high (+1 to 5MORE rolls). Low Physique means you have to two-hand all melee weapons; high adds +1 Additional Hit to melee damage. Low Craft makes reading and writing difficult, high Craft nets +1 spell known. Low Spirit means that you’re likely to be hit by random effects (unlucky), while high Spirit nets you +1 Mana and a 1/session die reroll. Hits represent how much punishment the character can take. They are determined by the Way (i.e. class level) taken. Level is measured from 1 to 12 and is used to categorize PCs and threats. Tiers are the character’s status in the setting; Up to level 3, characters are tier 1; level 4 – 6 = tier 2, level 7 – 9 = tier 3 and level 10+ characters are tier 4. AFG knows three ways: The Way of Magic would be the caster class; 1d6 Hits per level. 1st level spellcasters know 3 spells: Unveil Arcana (AFG’s detect magic) and a spell of level 0 and 1. They start with 1 Mana and for each level gained, the caster gains an additional Mana and learns a new spell of one spell level higher – at 2nd level, you learn e.g. a second level spell. Spells may be researched, but more on that later. Mana replenishes after 6 hours good sleep, but each spell may only be cast ONCE per 24 hours. Spells are written down in Grimoires – while this evokes the traditional wizard’s spellbook, it make well take other forms. The caster engine also features two important items: Talismans allow a caster to cast the spell associated with the talisman an additional time per day, while Mana Vessels are basically Mana batteries. Casters can’t cast in armor and are not trained in armor and shields. Spells that require concentration only allow a caster to move 10 feet per round and any tasks beyond the painfully mundane requires a Stubbornness save to avoid breaking concentration. Non-instantaneous/non-permanent spells can be prolonged by expending additional Mana. The Way of Steel nets 1d6 + 2 Hits per level in the way of steel. Hits are tied to fighting skill (more on that later) and way of steel characters may later develop or learn secret weapon techniques. These fellows are obviously trained in armor, shields, etc. The Way of Arts would be the specialist/thief (called practitioner here), who gains 1d6 Hits per level and is trained in light armor, but not shields. As skill specialists, they can distribute 5 EXPERT letters per level. They also may actually earn a modest living without murder-hobo-ing. Characters can freely multiclass, which allows for e.g. armored casters, though there are limitations in play to avoid abuse. At first level, casters and practitioners roll 2d6 and pick the best result; fighters roll 2d6, pick the best result, and then add +2 o determine the Hits at 1st level. (Yes, you may end up having just 1 Hit.) Hits are regained at a rate of 1 Hit per day, though spells and medical assistance may hasten that. Temporary damage is recovered as a rate of 1 Hit per hour of non-strenuous activity. Upon gaining a level, you roll one die for ALL levels attained (fighter add +2 per fighter level) and compare the result with your previous maximum – you keep the higher version. The German old-school RPG Midgard employs a similar mechanic and it works remarkably well to even out the playing field, while keeping the power-curve relatively flat. If your Hits go to 0, you keep tracking negative Hits. You roll 1d6, add your negative Hits and consult a table – on 14 you’re dead, otherwise broken bones, scars etc. can happen. If you’re staggered, you can’t act, defend at -1 and roll an extra d6 on that table when dipping below 0 Hits. Now, how are tasks resolved? Well, 5MORE, as per the rules depicted above. However, there is an additional component that also reminded me of Midgard: When you succeed at any given 5MORE task, you roll a d6. On a 5 – 6, you roll an Experience Roll. If that roll comes up as 5 or 6 as well, then you add an EXPERT letter next to the task. First time an “E”, third time a “P” – until you spell out the word EXPERT. This means that the character gains +1 to all 5MORE rolls with that task. After you’ve become an EXPERT in six Tasks, you can claim the title MASTER for one of your EXPERT skills. You erase the EXPERT letters and instead write down MASTER – in this one skill, you get an additional +1 to 5MORE rolls. The book provides a variety of sample tasks, but encourages groups to come up with their own array of tasks – this allows you to emphasize or de-emphasize breadth of skills as desired. If a task would require more than 6 to succeed, it requires a 6, plus an additional 6 for each point above 6 – so a task with a difficulty of 8 would require three consecutive 6s to succeed. Saving throws are rolled as 5MORE-tests, but they are modified by the character’s Tier – 2. First level characters thus save on 6+. AFG uses 5 saves: Alertness, Awareness, Toughness, Stubbornness and Morale. Saves are Tasks and can accumulate EXPERT letters and you may become a MASTER in one of them. AFG has two different combat-engines. Base damage in both is 1d6, +1d6 for each point of FC; wielding a two-handed weapon with high PHY adds +1d6. Armor comes in 4 categories and decreases your speed. The first of the systems is called 5MAIL. Akin in structure to THAC0, this means that you need 5+ to hit chainmail, less against targets with less armor, more than versus better armored targets. Simple. Skill at arms is measured by Fighting Capability (FC). 1st level characters have FC 0, and a character’s FC is equal to the character’s Tier minus 1. Additional Hits (the +2 Hits gained by fighters) also increase FC, as per a table. Every 4 additional Hits increase FC as though the character level is +1 higher. Melee, Block and Missile are Tasks like any other. A 5MAIL combat round takes 6 seconds grouped in 4 phases. It should be noted that each character can only act in ONE phase. Melee phase lets you attack, charge (move twice melee speed, attack at +1, but that bonus also applies to the target of the charged foe), shield block (negates a successful attack on 5MORE. Then comes the Missile Phase: Cover and Range decrease 5MAIL rolls. In the Manoeuvre Phase, the character can move up to twice their melee speed. Magic Phase is last – here, spells are cast. Spellcasting must be announced at the start of the round, one round in advance for spells that take longer, etc. If the spellcaster takes damage before finishing the cast, the spell and Mana is lost. In 5MAIL, armor reduces the chance of being hit. The second system is FIGHTMORE; it sports the same phases and basic structure, but melee is a contest of FC, with a potential for both contestants hitting their target. This makes the combat, obviously, not more complex – just more swingy. Charge in the system is also more volatile, adding a bonus damage die to damage dealt and received. In FIGHTMORE, armor reduces damage incurred by 1- 3, depending on how heavy the armor is. Personally, I think FIGHTMORE is a bit ironically named – if anything, players will want to fight less, considering that the results are more unreliable and not necessarily more complex or rewarding. Just my 2 cents, btw. There are a couple of optional rules for shield smashes, morale or hacking through mooks. More rewarding would imho be the alternate rules for different weapons: Flails e.g. can’t be blocked by shields, spears inflict damage first, etc. – this aspect is probably the best component of FIGHTMORE. The book also provides means to tweak the combat engines. As a roleplaying game book, AFG provides values for hirelings, travel, equipment, etc. It should be noted that searching for hidden things is done EXCLUSIVELY by the players – no task is assigned to it, so if you don’t think of checking that chest for a secret compartment…well, though luck. That’s one aspect I really like. Now, as faith is concerned, AFG uses the term Venerable as a catch-all for godlings, spirits, deities, demons, etc. Venerables are appeased by Worship, by Henosis (emulating them) and Charisma is the term employed for being favored by the venerable. Some sample cults, from Cthulhu to Dove (Queen of the Underdogs) and Saint Eleuther (savior of the lost) are provided and feature some nice, quirky and interesting angles. As you may have gleaned by this aspect, we have now wholly entered the more complex aspects of AFG, with spell research and design rules being per se not bad, but rather complex – on the plus side, the system does emphasize the serious benefits of having assistants/apprentices – I strongly recommend spellcasters to invest in them when researching. Spells have a range, casting time and duration as well as a spell-level, which may reach from 0 to 12. 9 example spellcasting traditions are provided, most of which sport 1 spell per level, though e.g. Goetia only extends to level 6, while dendromancy only comes with a level 0 and level 1 spell. That being said, conversion from OSR games (and current games), should be pretty easy. AFG does emphasize magic as less of a damage dealer and more as a wondrous tool, which, in general, is something I applaud. Now I did mention combat secret techniques – while also complex, something you design yourself, etc., these are much more basic than spells. They prevent you from gaining MASTER in a Task, but increase your Hits. Yeah, I was also rather underwhelmed. Neoclassical Geek revival has, system-immanently, a significantly more interesting melee system. Experience is btw. gained by securing (and escaping with) treasure troves and by achieving character (and party) accomplishments. The book also features tier-based rules for holdings, a monster-generator and a brief magic item generator. The final section of the book is devoted to a 14 page hexcrawl-y adventure sketch; the map is pretty small on the page and no player-friendly version is included, but its premise is interesting: What if Switzerland had volcanoes, a temple of Cthulhu and some messed up critters. The adventure, while featuring a cool premise, is ultimately just a sketch you need to expand and develop – as provided, it is a skeletal structure of a nice region to adventure in, but you can’t use this well for go-play style gameplay. Editing and formatting are very good, I noticed no serious accumulations of issues on a formal or rules-language level. Layout adheres to a 1-column b/w-standard, with artworks being a combination of a few original b/w-pieces and thematically-fitting public domain sources. The softcover is…well, a solid softcover. I can’t comment on the virtues or lack thereof of the pdf version. Paolo Greco’s AFG is a weird little system and I frankly am not 100% for whom it was made; on the one hand, you have a really simple, fun, rules-lite foundation with 5MORE and its 5MAIL combat. On the other hand, FC calculation is, to me, a bit more obtuse than it should be – when I pick up a rules-lite game, I expect such a central aspect to be…simpler? At the same time, the system tries to account for more complexity for veterans, with spell research, FIGHTMORE etc. endeavoring to capture new-school options. In that latter aspect, the game, at least in my opinion, fails. Apart from the nice peculiarities of weapon groups, FIGHTMORE essentially makes me want to fight less – very swingy results can be very frustrating in the long run, and honestly, from shield-bashing to charging, the “tactical” options feel like they were jammed into a rules-corset that is simply not designed to account for vast complexity. That is not to say that it doesn’t work; that’s just to say that I fail to see the appeal. When I want brutal complexity, I play PFRPG. When I want to play OSR with new-school combat that sports serious tactical depth, I wholeheartedly recommend Neoclassical Geek Revival. So yeah, the “New School mechanics”-component here…not that well done. That being said, AFG does have serious value, as far as I’m concerned – at least for a very specific target demographic. When used as a rules-lite RPg for beginners, it’s easily taught, plays fast and is, ultimately, fun. And if you absolutely want to play a campaign with a d6-only system, it has the tools to make that happen without becoming bland. While I maintain that the more advanced rules feel a bit tacked on to the simple chassis, they do help to keep player interest in the long run. If you’re e.g. a fan of Kort’thalis Publishing’s offerings, but fear that their default VSd6-engine (which, I maintain, works best for one-shots and brief mini-campaigns) will prove boring for your players in the long run, then AFG will be exactly what the doctor ordered! Slightly more complexity, but not that much. Now, as a person, this system ultimately did not resonate with me; I appreciate the components of flavor here and there and some aspects of spell research (if not the entire system), but, as a whole, this didn’t really do anything for me. As a reviewer, though, I can see the appeal this system can have for some groups out there and it is NOT a bad system! The organization etc. is simple, efficient and I can see people having fun with it. Still, the nagging feeling remains that this would have benefited from being two systems – one simple and one complex. The “complex” components herein tend to be underwhelming, also due to the space available. Focusing on one type of gameplay would probably have been the more prudent decision. In the end, my final verdict will clock in at 3.5 stars. Usually, I’d rate up due to in dubio pro reo, but considering the very specific demographics, I feel that this is closer to 3 stars than 4, also since fans of really rules-lite games will probably consider a couple of the more complex components…well…too needlessly complex. You can get this game here on OBS! This massive campaign setting clocks in at 279 pages, 1 page front cover, 1 page editorial, 3 pages of ToC, 1 page SRD, 3 pages of advertisement, leaving us with a massive 270 pages of content, so let’s take a look! Picture a colonial nightmare, for beyond what we saw in real life: During the Meiji-era of real world Japan, the feudal, isolationist Japanese culture was forced into accepting a new globalized world order; the analogue continent of Soburin, setting of this campaign setting, has seen a less benevolent interaction, one characterized by more than a century of oppression and exploitation. As such, the development of the new technology brought to Soburin did have radically different consequences for Soburin than for its real world analogue. Where Japan’s persecution of Christians and rigid caste system broke down, where the age of the samurai ended, in Soburin, the length and relentlessness of the oppression faced resulted in thoroughly different dynamics, dynamics characterized by the magic and technology that suffuses the world. This era of oppression, however, has ended – but not in a revolution for freedom. Instead, it was the eponymous mists, the monsoon rains, the catastrophes that seemingly separated Soburin from the rest of the world. If you’re like me, then this will undoubtedly put a smile on your face – yes, this book is proudly inspired by my favorite setting of all time, Ravenloft. In fact, if I were to provide an elevator pitch for the setting, it would be “An even more messed up Meiji era Japan + Ravenloft + Steampunk.” If that is enough to sell this campaign setting for you, then go ahead – chances are that you’ll enjoy this. So, we all know about the importance of honor, face, etc. – everyone who had to work with other cultures or who has been exposed to them from one form of media or another, will most assuredly encounter differences. Even between related cultures like the American and European cultures [plural refers to both – I wholeheartedly subscribe to the theory that there is a vast plethora of American cultures], different values and taboos exist, in spite of both being generally considered to be part of the Christian part of the world. Now, if these differences and potential problems already exist for related cultures, you can picture the issues when dealing with a thoroughly different culture and way of life. It is easy to get caught up in exotisms, xenophilia or xenophobia -and more often than not, roleplaying games tend to generalize “Asian” – cultures and throw concepts together willy-nilly. Beyond being potentially insulting, the problem I tend to experience in such a context has always been that such melting-pot catch-all settings tend to lack a sufficient stand-alone identity, that they feel *wrong* to me. There are precious few exceptions to this rule, with Rite Publishing’s Kaidan being one of my favorite examples. Another potential issue that this campaign setting faces, would frankly be the pitch: Ravenloft Japan with steampunk. Okay, that can be pretty amazing…but can it surpass the conglomerate of its components, or will it remain a jigsaw of pieces that do not really gel well together? Well, in order to analyze that, let us being with the rules and analyze them from the ground up. It should be noted, that approximately 100 pages of this massive tome are devoted to player-facing options. As such, I can’t analyze them all without bloating this review far beyond what would be useful. As such, I will instead focus on providing an idea of the respective options. All right, the first thing you need to know, would be that Mists of Akuma sports two new scores – they behave at once like attributes and differently from them. These would be Dignity and Haitoku (“haitoku” translates, unless I am sorely mistaken, to corruption, immorality, lapses of (social) grace) – from this constellation, you should realize that they are indeed kind of entwined. A new character begins play with a dignity score of 10 and a Haitoku score of 10. At the GM’s approval, a new character may choose to have a Haitoku score of up to 15, and it should be noted, that both the new backgrounds featured herein, as well as the PHB-backgrounds modify these scores. Speaking of the PHB-backgrounds – they have been translated to their cultural equivalent in Soburin without eating up too much real-estate, page-count-wise. I digress. After character creation, an increase in one of these attributes results in a decrease of the other by an equal amount. For creatures lacking either score, Charisma acts as the stand-in for Dignity, while Wisdom is used for Haitoku. You will probably have already deduced that, but yes, Dignity is pretty much how a character is perceived regarding ideals/behavior/etc. ; it can be pictured as a combination of honor, face and reputation, if you will – and dignity has overlaps with Charisma. Breaching etiquette can call for Dignity saving throws, which also may be called for to resist Haitoku-based abilities and it governs e.g. the ability to gain travel papers, show the appropriate etiquette, etc. But it is also an important, metaphysical concept. More on that later. Haitoku, on the other hand, is both the measure of Intimidation, the depth to which a character is willing to go; while obviously connotated with evil, it also represents the measure of the character’s spiritual perseverance to unlock e.g. the power of magical items. It allows the character to fight back from the brink of death – in short, it is not necessarily evil – more a measure of the uncompromising drive of the character to do whatever it takes. It should also be noted that the breathing of the mists of Akuma requires a Haitoku save. It should be noted that Dignity cannot be substituted here – the higher your Haitoku, the higher the chance you’ll be able to resist the mists. At least, that’s what the rules of the Haitoku attribute state. The rules for the mists themselves, unfortunately contradict this, calling for a Dignity saving throw instead to resist the effects of the mist – which makes less sense to me: Considering the tone of the setting, I think Haitoku may be the more sensible option. Haitoku can btw. also be used to resist mind-bending horrors as a kind of sanity-save. Okay, now this tapped into the eponymous mists, so let’s take a look at them: As mentioned before, the rules do contradict those presented by the attributes, which is a bit of a bummer. The pdf provides 2 conditions: Hated puts you at disadvantage regarding Charisma- or Wisdom-based checks against humanoids who do not have the condition, simulating the practice of cultural ostracization. The Misted condition comes in 8 levels and a creature always has a number of permanent misted levels equal to the creature’s Haitoku modifier. While examples are provided for the effects of each step, this remains thankfully open for the GM to tweak. The misted progression can be pictured as a kind of dark powers-corruption, beginning with relatively subdued effects and increasing them to pretty serious benefits – though stage 8 represents full-blown transformation into an oni – and as such, NPC-dom. The saving throw to resist exposure to the mists would be Dc 8 + 1 per previous save in the last minute – failing the save means that the character accrues 1 point of Haitoku, which, however, does not reduce the character’s Dignity…oh, and it can raise a creature’s Haitoku above 20. The astute reader will have noticed that running from the mists will be a more than popular tactic – after all, the Haitoku modifier governs the misted stages! Prolonged exposure can make you go oni VERY fast. There also would be a skill associated with Dignity, namely Culture. You can choose it instead of any other skill proficiency you’d gain from class or background. This allows you to avoid social faux-pas, insulting gifts, etc. Religion-wise, Soburin lacks true gods per se – as such, mythical beings like the Imperial siblings, yai sovereigns, etc. are representations of the divine, with the practices of placating the kami being the most prominent remnant that remains of Soburins Shinto-analogue. Since we have already touched upon backgrounds, let us take stock of them: There are 8 new ones: Disgraced amputees can begin play with augmetics, for example. The backgrounds generally are more potent than those in the PHB, but mostly in line and flavor-wise, interesting: Gaining some gadgets, being a shinobi, rules entwined with mists etc. – the backgrounds are interesting. That being said, they are only focused on the rules v- the complimentary dressing-tables you know from the PHB are not included herein. There is one background that is either extremely important or problematic, depending on your particular execution of the setting: The Yamabushi background lets the character perform a cleansing ceremony: The target of that ceremony may make a Dignity save – on a success, the target loses 1d4 Haitoku. While this does not increase Dignity and thus does not wholly trivialize the corruption-angle and provides an easy angle to exert control over Haitoku from the player-side, it does allow for a relatively easy way to decrease the score that may not gel well with games that use the mists themselves more sparsely. Okay, so what about the class options? Okay, so the first would be the Bushibot, a fighter who gains augmetics sans Haitoku-increases. The shinobibot would be the equivalent for the rogue class. There are two druid circles: The circle of the blight is basically an evil circle focused on decay, while the circle of shifting is a more complex modification of the druid – it does not grant the usual spells, instead focusing on unlimited wild shapes – and yes, thankfully, the circle does account for the loss of spells regarding in the later abilities. The clockwork adept wizard can generate basically limited clockwork spells, which are not subject to being dispelled or countered – which can be a truly potent…same goes btw. for the level 14 ability that nets you a clockwork creature of a challenge up to the wizard’s proficiency bonus. The bardic college of the gun nets you an enchantable, powerful vested gun that you can enhance in a variety of ways. The detective rogue is a skill-user specialist, obviously inspired by PFRPG’s investigator class – the class gets a pool, which allows the class to add surge-like bonuses to skill-checks. The herbalist rogue gains a very limited array of spellcasting and, at high-levels, even potent explosions – minor complaint here: Spell-reference not italicized. This is btw. a complaint that can be made multiple times. The ju-wai shu sorcerer bloodline is a master of the calligraphy staff who can tear open reality to negate attacks/spells – with a hard cap. One of my favorites herein. The kami domain cleric is a neat offering, while the mage wizard is a good example of the classic scholar. Minor complaint: The most potent option allows for the combination of spells, which causes damage – the type of which is not properly codified. Martial Artist monks make use of the martial arts feats. Ninja rogues can throw multiple kunai/shuriken with one attack and gain the proper Stealth etc. tricks. The path of the faded for barbarians is cool: You ooze necrotic mists and upon ending the effect, you temporarily accrue misted levels. The priest monk gains limited druid spellcasting and blends martial arts with these tricks. The paladin can choose to follow the samurai sacred path, sporting ancestral weaponry, iaijutsu and sums of the tenets – solid. The tattooed monk can trigger magical tattoos via ki – cool. The tsukumogami hunter ranger is guided by a spirit of a former hunter and is particularly adept at dealing with these threats – more on the tsukumogami later. The Wu-jen warlocks, finally, are associated with the tainted nature of Soburin, and come with taboos: One patron for each of the 4 seasons can be found – and additional notes for the flavorful integration of them are provided. As a whole, I considered the class option section to be pretty neat – they are flavorful and offer some interesting options. Not all are glorious, but as a whole, I like the themes they represent – particularly the warlock-wu-jen-analogue was interesting. Okay, let’s move on to the array of races. The pdf does sport notes to play spirit-folk and Korobokuru, the elf- and dwarf-equivalents: Humans are changed – the base race gets three different ethnicities: The native Soburi, the Ceramin (tech adepts) and the Ropaed – foreigners and socially adept. The goblins of Soburin, the bakemono, also come with 3 subraces – one of which can assume swarm form. Minor complaint: It would have been more convenient to have the swarm form’s insect swarm stats in the write-up. Enjin are monkey-people wit advantage on saves to resist exhaustion…but also more expensive armor-fitting and vulnerability to cold. No less than 7 different hengeyokai can be found herein, one of which sports a +1 bonus to all saves – rules-aesthetically not my favorite choice for the representation of luck in 5e, but oh well. Oh, and there are 4 hengeyokai types that ostensibly are extinct – stats have still been included, for they are rare and secretive, but yet survive. Kappa are interesting – tough and armored, but they also have a harder time standing up. Mutants are ostracized and hated…but honestly, they feel like a race that doesn’t really fit that well with the tone of the setting. The necroji, finally, is a skeletal thing that houses an amalgamation of 9 souls, with a ton of immunities, but also radiance vulnerability. The oni-touched are not transformed by the mists at stage 8 – they are hated, but can move freely through the mists, trivializing the threat for the race. Psonorous are embodiments of all that is good in the dying world – two variants are provided. The pyon frog-folk are one of the more intriguing and well-situated races herein – they are deeply entrenched in the setting, sport more lore – they are, in short, more interesting. The shikome, another race resulting from exposure to the mists, would be the shikome, who can 1/turn deal an extra 2d4 damage hit with a melee weapon – they come in two versions. Not a big fan of them. Surprisingly, the construct-race of the setting, the steametic, is actually pretty well-balanced and interesting. Tengu and Tanuki can also be found, as can Umibo – people of living water, which are pretty interesting. Regarding races…I couldn’t help but feel that less would have been more in the race-section. The mutants, necroji and shikome, to me, do not feel like they should necessarily fit well within the contexts of the setting; the different levels of detail provided for the races also contributes somewhat to that impression. In the end, the chapter does feel a bit like it wants to cover all those weird-race cravings some player may have, but loses some of the settings integrity, leitmotif-wise. Just my opinion, obviously. The book also contains a wide variety of feats – from the aforementioned, customizable Ancestral Weapon – really interesting execution there. There is an investigation-based Deductive Mind feat for PCs that want to want to fail forward (an alternate investigation that always proceeds the plot somehow). Transforming into a Soburin-clan’s creature, good reputations, staring down foes with your killer’s glare, supernatural, mist-based abilities – in these, the Haitoku/Dignity thresholds become important. It should be noted, that although Haitoku and Dignity are pretty fluid, the score at the time of gaining the feat counts: You can thus gain some serious abilities for roleplaying characters that oscillate between redemption and damnation. Now, I have already mentioned Martial Art Stances: These feats can be taken up to 3 times; In their basic form, they e.g. add fire damage to your attacks ; taking the respective feat multiple times adds usually resistance and immunity to the respective damage type, with some of the more common damage types gaining additional benefits…which does bring me to a slight problem: The damage-scaling for them is identical, making e.g. force damage a significantly better choice than e.g. the often-resisted fire damage option – and the additional benefits don’t really manage to catch these discrepancies. More unique benefits that transcend numerical escalation would have probably made these more interesting. Stances work only with unarmed strikes, shortswords or simple weapons and unarmored characters increase their AC by the stance feats known. Proficiency bonus (not modifier, as the pdf calls it – minor hiccup) acts as a cap for the maximum number of stance feats known. Problematic: The Martial Artist monk mentions a maximum number of stances that the character can be in at any given time –a limit curiously absent from the write-up of the feat-section. It should also be noted that taking multiple stances can provide a lot of simultaneous damage types, which is a pretty strong option in 5e’s rock-paper-scissors-based gameplay regarding vulnerabilities and immunities. Okay, so what about the equipment-section? Well, here we have some interesting bits indeed: Variants of gunpowder, locking garrotes, 5 different armors – some intriguing options here. Firearms include an anti-scavenging caveat (good!) and otherwise behave pretty much like loading weapons. There are, however, a couple of questionable components here: The hand hwacha, for example, can fire 13 bullets at once, hitting each target in a 30 ft.-line (how wide? I assume 5 ft., but it could be just as well 10 ft., analogue to e.g. gust of wind) with a separate attack roll for each. This deals a whopping 4d6 piercing damage to targets. Okay, the weapon is costly and reloading it to 13 takes a lot of time, but still – why not simply employ a capacity-engine? RAW, it’s either all 13 or single shot. On the plus-side, I liked the grappling hook launcher – I would have liked it even more, if it specified how much it could carry (the PHB is annoyingly opaque there), but oh well. The book also contains some interesting vehicles. Now, I mentioned the augmetics – the steampunk-prosthetics and augmentations. Installing these requires a Wisdom (Medicine) check versus “5 + Dignity modifier” – I *assume*, the modifier of the patient is meant, not that of the one installing the augmetic. The installation is grueling and makes the target take 1/2 maximum hit points in damage. Augmetics may be directly targeted at wearer’s AC +6. The augmetics follow a formula of magic items in presentation, with scarcity ratings etc. However, they also cause the person with the augmetic to gain varying amounts of Haitoku – in that way, not like Shadowrun’s essence attribute. These range from +1 to +1d4 per augmetic. Somewhat problematic: The book remains curiously silent on how these permanent body-modifications interact with magic items – I assume they do not count towards the maximum of attuned magic items and that they just work, but some note on that interaction would have been nice. Also weird: A couple of backgrounds and class options grant Tool Proficiency: Augmetics – but the book never introduces the toolkit, and the implanting of them is done with Medicine. Augmetics can be destroyed, as many come with hit points. Weird: Some note that they can’t be targeted…while others simply remain silent on the matter, leaving me guessing there. If you btw. expected a big chapter here – that is probably a component, where the book could have used more content. A lot more content. The augmetic-section spans barely 3.5 pages, which isn’t much, considering that it’s a central selling point and pillar of the setting’s vibe. The book also sports a brief chapter on spells…which would be as well a place as any to note that, while for the most part, the rules-language is tight, there are a few Pathfinderisms to be found – references to subtype instead of subrace, a few references to PFRPG action types (thankfully few and far in between) – but yeah. Why do I mention that? Well, we have a remnant “Personal” here in the ranges, a reference to “target” that should reference “you” – mostly aesthetic hiccups. Strike within and without, however, is somewhat problematic: You choose a creature you can see within 30 ft.. Wait…is it 30 ft. or 60 ft.? The book contradicts itself here. Anyways, the creature takes damage as if critically hit by your melee attack, and you take half the damage dealt as damage. This damage ignores all resistances and immunities. 2nd-level spell for rangers and palas. As a whole, I wished the space allotted to the spellcasting section had mostly been used for more augmetics – though there are a couple of interesting components here: E.g. there would be a spell that influences the season-based options of e.g. the Wu-jen – that is creative and interesting. Okay, so this would sum up the rules-centric section of the book. Approximately 30 pages of the book are devoted to Kyōfū, Sanbaoshi and Nagabuki – three absolutely glorious cities. The writing here is inspiring and interesting – and frankly, I wished, we got more. 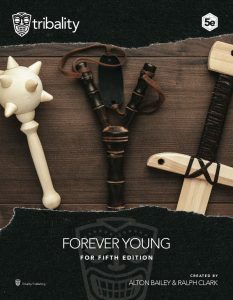 Thankfully, the book proceeds to blend flavor-information with another type of crunch: Namely 60+ pages of information on the clans and powerful factions of Soburin – each comes with at least 2 statblocks and yes, we do get an entry of oni overlords on yai sovereigns – and yes, there are locally forbidden technologies. In the stats, there are a few instances of dual damage-types – which makes it hard to discern if the damage is supposed to be half each or once the full damage in damage type I and once in damage type II. This can be particularly wonky considering 5e’s approach to damage types and the resistance mechanics. This can btw. be also observed among the otherwise pretty amazing dragons that get their very own chapter. The oni/monster chapter once more is massive and sports some serious gems beyond traditional Japanese monsters – however, these beasts receive a context, mostly courtesy of the setting’s unique set-up: Qirin, Tikbalang, Jiang-shi, Yuki-onna…and some classics and gems: Longhair ghosts, rokurokubi, gaki…neat monsters with unique abilities. The stars, though, would be the tsukumogami: Objects that turn 100 may well gain sentience – and represent one of my favorite monster class in ages, including basically a demon-tank. Yeah. Amazing! The final 25 pages of the book are taken up by the adventure “Revenge of the Pale Master”, intended for PCs level 8 – 10. The adventure takes place in the city of Kazi, just before the Festival of Falling Hawks. Children have disappeared. An ancient evil rises. The adventure is one of the highlights of the book: It is a flavorful investigation with nice maps, mugshots of the characters, some cool NPCs and advice for running the NPCs. The module is interesting, well-written and provides some nice further adventuring – as far as modules for campaign settings are concerned, this is definitely one of the good examples, particularly for the allotted page-count. Editing and formatting on a formal level are surprisingly good for a book of this size. The rules-language, on the other side, is not perfect. It’s not bad, mind you: I checked a LOT of the statblocks and the math is surprisingly solid. The book gets a lot of different, complex rules-operations completely right…but, you know, the book also sports several hiccups that do influence the rules-integrity. It’s small things in the finer details…but they do accumulate. Not to the point where they can sink this book, but they do detract a bit from it. I considered the basic Dignity/Haitoku-glitch particularly jarring. Layout adheres to a very dense standard that oscillates between one and two columns. The layout, while dense, is not as cluttered as in Mike Myler’s previous campaign settings, making the book, as a whole, more aesthetically-pleasing. Artwork and cartography-wise, we stick to a b/w-illustrations that range from cool original pieces to stock art and public domain art that has been properly modified – it may sound strange, but the latter tweaks actually represent some of my favorite pieces herein. The book sports a lot of dark pages with white text – to account for that, we actually get a printer-friendly version – huge kudos! Comfort-level-wise, the tome comes with a metric ton of nested, detailed bookmarks, making navigation comfortable. Mike Myler, with additional design by Savannah Broadway, Luis Loza, Michael McCarthy, Christopher Lee Rippee, Jaye Sonia and Bryant Turnage, has managed to achieve something here, let me make that abundantly clear. In fact, this is, at least in my opinion, the best campaign setting Mike Myler has crafted. While he tends to focus on the big picture, we get more details this time around, the information gels together better – Soburin feels like a place I want to run; it has the details and style. The campaign setting presented here is inspiring. It is more than the sum of its parts. It is more than just a Ravenloft-clone in a Japanese dressing. Neither is it just a steampunk-infusion. The continent comes alive as something more than the sum of its parts. 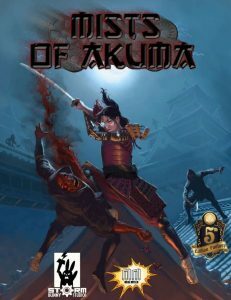 Mists of Akuma is a thoroughly interesting, intriguing setting. Let me make that abundantly clear: I adore this book. I really, really do. To the point where this had the potential to make my Top Ten list. Yes, that good. That interesting. At the same time, the aforementioned small hiccups accumulate. And there’s another component that prevents this book from realizing its true greatness to the full extent. Japanese Steampunk Ravenloft would already have been rather hard to get done right – and the book *mostly* gets this very tall order right in an exemplary manner. At the same time, we have these…strange tidbits that contradict the basic premises of the setting. From weirdo races to options to trivialize parts of the basic engine, the book almost feels at times like the authors (or one of them) at one point became frightened that one type of player wouldn’t like the setting, thus opting to try to cater to more folks…but this decision, at least in my mind, compromises, to an extent, the glorious flavor of the setting. There are basically apologetic options here – and they take up real estate that the setting could have used better. It’s small things that give me this impression…and it thankfully is rare. It makes me feel like the visions of what the setting is supposed to be diverged to some extent among the authors – here’s the thing about anything noir/dark fantasy/horror: If you already are a full-blown monster and/or immune to the one corruption-source, why bother playing in that setting in the first place? It’s like playing CoC with immunity to becoming insane, like playing Vampire: The Masquerade sans bloodthirst or angst. Thankfully, these problems can be cut out of the book. There is a second aspect of the book that SERIOUSLY underwhelmed me. Augmetics. Don’t get me wrong. I liked what I saw herein. But for a setting that is very much defined by 3 components, namely Japanese-inspired + Ravenloft + Steampunk, 3.5 pages of augmetics…isn’t enough. Not nearly. At least in my book. Mists of Akuma would have needed, desperately in my opinion, more of them. They are cool and an integral part of what makes the book so cool, what makes Soburin this amazing. Compared to that, some of the races, some of the spells and the metric ton of critters herein may be okay…but they all take up real estate. Focusing on the core ideas of the setting, on the thoroughly amazing, unique selling propositions of Soburin and providing more on them would have made this a true masterpiece. You see, the flavorful entries we do get, the notes on the places, are inspired. So are the cool tales of the clans, many of the monsters – this is an inspired, great setting. One that is worth owning, that has great ideas, that feels unique and distinct. This is a really cool setting. At the same time, it is a book that, more so than Veranthea and Hypercorps 2099, borders on the verge of true greatness – and frustratingly feels like it holds itself back from that final step to true excellence. If you enjoy different, interesting settings, then check this out – it is certainly worth owning! For my final verdict, I will settle on a final score of 4.5 stars, rounded down for the purpose of this platform. However, since I absolutely adore a lot about this book, I will still add my seal of approval to this. You can get this unique toolkit/setting here on OBS! as you all know, I am not an American; however, a lot of my readers and friends are from the states and I like the sentiment of the holiday of saying “Thanks!” from the bottom of my heart, so here goes, if slightly belated! First of all, my heartfelt thank you and gratitude belongs to all my supporters on patreon – without you fine ladies and gentlemen, there would be no endzeitgeist.com and I’d probably be forced to fade into the shadows. I can’t thank you enough. Secondly, I consider myself privileged to know so many truly amazing people in the industry; in no particular order, my thanks go out to Paco Garcia Jaen of GMS magazine, Jonathan Nelson of AAW Games, Lou Agresta, BJ Hensley and Daniel Marshall of Playground Adventures, Stephen Rowe, J Gray, Greg Vaughan of Frog God Games, Creighton Broadhurst of Raging Swan Press, Miranda Russell of Rite Publishing, Mark Gedak of Purple Duck Games, Alexander Augunas of Everyman Gaming, Erik Mona of Paizo, Owen K.C. Stephens of Rogue Genius Games, Jeremy Smith & Andreas Rönnqvist of Dreamscarred Press, Wolfgang Baur of Kobold Press, Jason Nelson of Legendary Games, Rick Hershey of Fat Goblin Games, Tom Knauss, Tim Hitchcock, Michael Sayre, N. Jolly, Lucus Palosaari, Stephen Radney-Macfarland, Ben McFarland, Troy Daniels, Erik Bauer of Gaming Paper, Adam Meyers of Drop Dead Studios, George “Loki” Williams, Chad Middleton, Kelly & Ken Pawlik of Dire Rugrat Publishing, Alex Abel-Shanks of Flaming Crab Games, Brian Berg of TPK Games, John Ling, Savannah Broadway, Dale McCoy Jr. of Jon Brazer Enterprises, Scott Gladstein of Little Red Goblin Games, Christen N. Sowards of Lost Spheres Publishing, John Bennett, Julian Neale…and the countless other amazing people I worked with, met and talked to. The people that create the games we all know and love. I consider myself to be extremely lucky to count you among my friends, my supporters…or just among the people that have created something beautiful, that craft a little window into wondrous places; that make our lives better with the laughter, excitement, cheers and tears their creations provide. Ladies and gentlemen, here’s to you! To all you authors and your wondrous prose, to the layout artists that make our books a joy to look at; to all the developers and editors polishing words to a shine; to all the artists and cartographers that create visual representations of the vistas within words – you are all heroes to me. Your work creates more joy and provides light, solace and laughter. Thank you. Never stop. 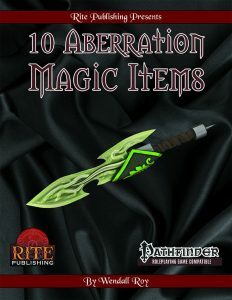 This collection of magic items, tying in with the fantastic „In the Company of Aberrations“, clocks in at 7 pages, 1 page front cover, 1 page editorial, 1 page SRD, leaving us with 4 pages of content, so let’s take a look! All right, we begin with an item that actually has a nice visual representation – the calamitous tentacle. Before you start yawning – the tentacle is NOT yet another tentacle whip – it’s actually a ranged splash weapon that detonates in icky bits AND that may attempt to grapple foes! Really cool! Encapsulated weirdness is delightfully disturbing: This item is a magical tumor that contains an extraordinary abominable weirdness, conferring its benefits to the “wearer” – oh, and if you don’t meet the prerequisites, it demands a steep price! See, this is how “gain feature x”-items can be amazing! The eye of undoing is basically a dispel magic and disintegrate spell in a can. Okay, I guess. The flute of mad enlightenment, Z-shaped and weird, is easier to play if you have tentacles (AMAZING!) and causes confusion…oh, and it can absorb magic missiles. Cool! Glasses of puresight clock in at 20K and automatically pierce mundane or magical disguises of aberrations. I really dislike this item, as it can wreck a plethora of plots. Harness of the Favored Pet is amazing – aberrations slap these harnesses on pets, allowing the enslaved humanoids to be handled easier…including command words to silence and pin them. Can you see the scenario where the PCs lead an uprising against chthonic masters? I sure as hell can! Mindkiller’s vise takes a painful toll upon donning, but does enhance the mental powers of the wielder with mind-affecting spells and SPS as well as the offensive capabilities in psychic duels. Nice. Synthetic skin suits are basically a combination of Disguise-enhancing stolen skins and bracers of armor, and thus come in 8 variants – solid per se, though personally, I am partial to Everyman Gaming’s Skinsuit Ritual for that particular concept. Voidcaller’s serum is unique: It makes being adjacent to the user very dangerous (untyped damage, no breath, fatigued…) and allows the user to call forth void-called beings. Basically a magic drug sans drug drawbacks…which, come to think, is something that could carry a book of its own. Now, as in most of these small item-pdfs by Rite Publishing, the final item herein would be a legacy item, namely Rift. This mighty dagger of crystal comes in 6 stages of improvement (legacy items improve as you gain levels and unlock new abilities); the dagger is nothing short of the stain on reality left by the first touch of Nyarlathotep. As such, it should not surprise you that the dagger can confuse targets, cuts rifts into space to conjure creatures, etc. – a flavorful item! I am particularly partial to the high level ability that, whenever you roll a natural 1, lets you force another creature to take a natural 1 on its next round! Editing and formatting are top-notch, I noticed no glitches in either rules-language or formal criteria. Layout adheres to Rite Publishing’s two-column full-color standard and the pdf sports 2 solid full-color artworks The pdf comes fully bookmarked, in spite of its brevity – kudos! Wendall Roy is one of the best-kept secrets, designer-wise – he constantly delivers intriguing, high-concept material with really cool, creative tricks and tweaks. This pdf is no exception – we get some really cool items herein. While personally, I loathe the flat-out auto-detection conferred by the glasses, that is mostly a matter of taste. Hence, my final verdict will clock in at 5 stars. You can get these cool items here! Missed the fantastic “In the Company of Aberrations”? You can get it here! This installment of the Star Log. EM-series of minis clocks in at 6 pages, 1 page front cover, 1 page editorial, 1.5 pages of SRD, leaving us with 2.5 pages, including the usual introduction, so let’s take a look! See, this archetype is a great example why I like Starfinder’s pretty open archetype-system – Assassins should be varied! There’s a reason I adore the more modular solutions presented for Assassin concepts in Pathfinder (most notably, the great Modular Assassin by Interjection Games and the exciting Assassins of Porphyra by Purple Duck Games). But I digress. The assassin-archetype presented herein grants alternate class features at 6th, 9th, 12 and 18th level. 6th level nets Death Attack. In order to use the ability, you must succeed a Bluff, Disguise or Stealth check against 20 + 1.5 times the target’s CFR; the respective checks are properly codified. On a failure, the target notices you as a threat, preventing you from performing death attacks against it for 1 day unless you spend 1 Resolve Point. Okay, is that an action? I assume not, analogue to many envoy improvisations, but I still think it would have been nice to see it explicitly stated. You must study the target for 3 consecutive round, and after that, you may move up to your base speed and then perform the death attack as a full-round action. The death attack must be executed with a melee or ranged weapon that you’re proficient with or a spell with a casting time of 1 standard action that deals Hit Point Damage and requires an attack roll against the target’s respective appropriate AC. Minor complaint – personally, I probably would have specified that the means of delivery determine the AC used, but that is pure aesthetics and won’t influence the verdict. If you hit with these paradigms, you deal normal damage to the target, the victim must succeed a Fort-save (governed by your key ability score modifier) and either be temporarily paralyzed or take bonus damage governed by item levels of the weapon in question. Nice for fans of the Starfarer’s Companion: 9th level-spellcasting classes get their spell-levels translated alongside Starfinder’s regular 6-level spellcasting progression. If the damage exceeds the remaining hit points, the target must succeed a second Fortitude save…or he’s dead – no bartering, no resolve – dead. You can’t make death attacks with unwieldy or explosion weapons or those that require a full action to attack. Spring Attack and Shot on the Run synergy are provided. It should btw. be noted that death attacks are NOT death effects! 9th level yields Hide in Plain Sight, already hinted at in Starfinder’s Hide skill use of Stealth, makes an appearance here – it pretty much does what you expect: Hide while observed, provided you have some sort of cover etc. The ability concisely defines interaction with darkvision etc. and other senses. At 9th level, there would be quiet death, which lets you make successful death attacks that kill or paralyze silent via Stealth. Pretty much the lack of the paralysis-option’s an oversight here. The 19th level ability enhances death attack: You can spend Resolve Points to reduce the number of rounds required for death attacks to a minimum of 1 round (2 Resolve) –spending Resolve this way doesn’t take an action, fyi. Additionally, foes slain via death attacks crumble to dust, preventing the more common ways of returning the dead to life. The last 0.5 page is devoted to the contextualization of the assassin archetype within the Xa-Osoro system shared by Everyman Gaming and Rogue Genius Games – we hear about the Dragonheir Concordance corporation, a ruthless kobold mining corporation; we learn about the roles of freelancers, the deoxyian gene-trading goliath helix and Sanguinary stewards, sworn to protect the coffins of the vampire lords – some cool angles here. Editing and formatting are very good, I noticed no grievous glitches. Layout adheres to the 2-column full-color standard of the series. The pdf comes with a solid full-color artwork and has no bookmarks, but needs none at this length. 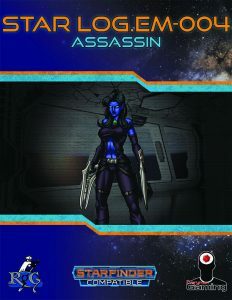 Alexander Augunas’ assassin had me start rather skeptically – the Skill-check based mechanic may yet be unhinged, as Starfinder, so far, is a very young system. That being said, the strict limitations in place and the relatively conservative formula mean that, basic math-wise, this will, at least for not, not come apart – and after that, the archetype still has some knobs to turn, so kudos there – smart design. I generally liked this archetype. I Sooo, how to rate this. I did enjoy this supplement, though, frankly, I would have liked to see some benefits for less optimal assassin-weapon-choices; RAW, range is pretty much king here, since the studying doesn’t have a range. That makes sense in Starfinder’s universe, obviously, but yeah, consider that to be a bit of a lost chance in my book. Ultimately, my final verdict for the revised editionwill clock in at 4 stars, +0.5 stars for getting the paralyze-oversight right in the revision. You can get this nice archetype here on OBS! This massive campaign setting/hexcrawl/toolkit clocks in at 134 pages, 1 page front cover, 1 page blank, 2 pages of editorial, 1 page ToC, 1 page back cover, leaving us with 128 pages of content, though it should be noted that they are formatted for digest-size (6’’ by 9’’/A5); Printing the book may not be the best idea, though; I’ll get to why soon. This review was made possible by one of my patreons, who donated the print copy of this book to me, to review at my leisure. My review is thus mostly based on the print version, though I have purchased the pdf-version as well to ascertain its properties. Okay, so the first thing you notice when looking at this book is that it is GORGEOUS. I mean it, a wonderful hardcover, solid, great. See that cover? On the inside of front and back cover, we get the massive hexcrawl map of the Isle of the Unknown; the referee version sports icons that show the type of thing that can be found on a given hex, making use of the book relatively easy; this is also represented in the layout. You see, the pages don’t sport that much text and pretty broad borders. Why? Because hex-shaped frames highlight the artworks of the strange creatures to be found here, with the respective hex’s number below the image. Thus, if you’re flipping through the book and see something you fancy, you can immediately find the proper hex. Better yet: The numbers denoting the respective hexes are color-coded by the general type of thing to be encountered in the hex. Speaking of organization: We get a monster-appendix that lists monsters by HD and hex (with small versions of their artworks) and separate lists of magic statues, magic-users and clerics by hex. We also get a list of settlements, by hex, though I need to comment on that later. I mean, look at that cover; while the monster artworks are more comic-book-like, we do get a ton of artworks of this quality: You see, this isle is home to a vast array of truly unique magic-users and they come with gorgeous one-page artworks; if you’re a connoisseur of beautiful fantasy art, this book may be worth getting for that alone. In short: The artists Amos Orion Sterns, Jason Rainville and Cynthia Sheppard have done a stellar job capturing the wonder of this place. Now, someone has read Carcosa. Oh. Wait. Sorry, scratch that. Someone has written Carcosa. This book is not simply an OSR-setting inspired by Carcosa, it was penned by the same man. HOWEVER, if you disliked Carcosa and its dark aspects, please read on – this is not a book that sports any kind of problematic or particularly dark content. Instead, the main focus would be non-Tolkienesque wonder. What do I mean by this? Well, I enjoy Tolkienesque fantasy; there is a reason it resounds with so many people. But there is a downside to the cultural dominance of this particular type of fantasy. We not only fail to see the vast cosmos of mythologies our own cultures have produced, we also blind ourselves to our past, as the tropes of this type of fantasy subsume other, creative and unique ideas. One of the things I love about the OSR-movement is that many authors are pushing boundaries regarding the tales they tell, that there are plenty of deviations from the dwarf/elf/halfling-defaults. In this case, we take a look at a type of fantasy that, to my, is reminiscent of psychedelic, experimental cinema like “Twilight of the Ice Nymphs”, of dream-logic…and if I had to describe this Isle of the Unknown in one sentence, I’d call it: “A crusader’s psychedelic hallucination of the antique.” This book feels very much indebted to the cosmos of creatures hinted at in a variety of pre-Tolkien fantasy, for example the Prester John myth, though the creatures herein a thoroughly distinct. The monsters I mentioned? Each of them is utterly WEIRD. To give you a couple of examples, I randomly flipped open the book and found “A 16’ tall aspen has four trunks rising from the ground to join into a larger trunk 6’ above the ground. One of the four lower trunks has the face of an ineffably sad human face.” Or “Seven crows can move only by levitating, and as such can never be more than 10’ from a solid surface. They have 4 legs, each terminating in a razor-sharp blade.” Or “Four limbless, serpentine beavers the size of wolves…” – yes, these weirdo creatures come with artworks. The sense of antiquity is also enforced by the sheer number of magical statues dotting the isle, which, style-wise, are reminiscent of Latin Decadence – you know, like a humble person witnessing the splendor of fallen Rome and Greece for the first time while on route to the holy land. I couldn’t help but hear a somber “Frater, Ave Atque Vale” in the back of my mind while reading this book – the atmosphere of the whole is impressive indeed. You’ve probably realized it by now – when I started reading this book, I was blown away. Utterly and thoroughly. The entries are incredibly creative and interesting. You can flip open any page and find something wondrous in this book; as the author comments in the beginning, the mundane is left up to the referee’s discretion. Mechanics-wise, armor is denoted “as leather/plate/etc., we get HD and Move values à la 60’ – I assume LotFP standard movement rates here, but I’m not 100% sure. More relevant and annoying would be that the aforementioned magic-users lack spells known – you have to crafted the lists yourself. At least a generator or something would have been appreciated there. It should also be noted that this has a Gp-standard, not LotFP’s usual Sp-standard. If wonder is what you’re looking for, if you are looking for fantasy reminiscent of a utopian fever-dream, then get this right now. Here is the thing, though: I can’t remember when a book started so strong…and then crashed to leave me disappointed at a high level. You see, this is very much akin to Carcosa in one crucial aspect: It is only concerned with the big picture; it lists hexes and is only considered with the big; you won’t find information on details, quests, etc. Speaking of quests – that may be the one of the two biggest drawbacks of this pdf in comparison to Carcosa: Carcosa sported implicit questlines by virtue of the dark rites required to control, conjure, banish and stop the Great Old Ones: PCs had to travel across the country, unearth strange things. There is an implicit structure provided for the referee to develop. There also are names, nomenclature, etc. – all magic-users and monsters, all places in this book, have no names. Similarly, there is no such implicit questline structure to be found in the Isle of the Unknown. There are precious few connections between hexes and creatures; regular persons and how they would react to all these wonders, how societies would work…these concerns simply never enter the picture. Similarly, all these monsters and mighty magic-users seem to exist in a state of blissful ignorance; there is no agenda, just idle magical frolicking. In a way, this almost feels like the antithesis of grimdark, grimy medieval gameplay, like a vision of a magical utopian pastoral. While I like this general notion, I really dislike how static and isolated everything ultimately feels. In short: Once you scratch the surface, the setting begins to come apart, at least to a degree. There is another problem that made reading the final pages of this as dissatisfying as the beginning was amazing: This is basically a 3-trick pony. Trick 1) Magic statues with weird effects. Solution: Don’t mess with them. Usually not worth it. Trick 2) Utterly weird, cool creature. Trick 3) Magic-user/cleric with powerful, unique ability. Messing with them is usually a bad, bad idea. Greedy players beware. Take one or more creatures, fuse them together and/or add/subtract limbs. Add strange skin-condition, top off with magic effect. Describe utopian domain of magic-user, add familiar creatures/elemental powers, potentially add means to penalize greedy, murderhobo-ing PCs. The problem here is that there isn’t enough change of pace; where Carcosa had aliens, dinosaurs, scifi tech, Spawns of Shubby, Great Old Ones, weirdly-colored men…this has weird monsters and weird magic-users. The isle of the unknown’s wonder becomes, paradoxically, common and mundane due to its concentrated accumulation, and, to a degree, boring even. At least when used as written. There isn’t enough to contrast the strange with; there isn’t enough detail to create a believable illusion of this place, a problem particularly evident when it comes to the settlements and general lack of things to do for the PCs. Don’t get me wrong – I don’t expect a hexcrawl to provide epic storylines – but you can seed adventures easily by means of items, feuds, etc. This book, at least in my opinion, fails at that task. Now granted- this book tries to just provide a wondrous sketch for the referee to develop…but said sketch remains very superficial; there is no depth-structure, no rhyme or reason to ANY of the proceedings, no occult significance to unearth regarding statues, the powers of the magic-users…anything. This is just weirdness for the sake of weirdness. Behind the coating of wonder this book presents, there lies a gaping hole of missing structures and global dynamics that needs to be filled…and frankly, I don’t have the time or inclination to do that. It’s puzzling, really – I never realized how important that aspect is before, and I’ve run a ton of hexcrawls. I always took that aspect for granted. Editing and formatting are very good; while I did not enjoy the deviations from LotFP-rules, at least this time, there are no ill-conceived rules that take up valuable real-estate. There are a few minor hiccups, but not enough to detract from the professional look of the book. Layout adheres to a one-column full-color standard and, as mentioned, is gorgeous and easy to use…however, it also sports pretty broad borders. The artworks are phenomenal and frankly, what sells this book – the fantastic artwork is superb; particularly the renditions of the magic-users are fantastic and cover-worthy. The pdf version comes fully bookmarked and with extra-pages of printable maps (kudos). Big plus: The pdf is layered in details, allowing you to control the content, icons on the maps, etc. – extra kudos there. I’d still recommend getting the print version, provided you can afford it. Why? Well, here’s the thing: If you’re like me and prefer reading a book from cover to cover, then this may well frustrate you. As noted, the 3 tricks this book has become stale with repetition. Fast. Having a print version makes flipping up the book spontaneously, easier. This book absolutely excels at its brand of wonder: Plants, utopian vistas, powerful magic-users and strange creatures that…just exist. The best use for this book is to simply use it as a weird infusion. Once you’ve been crawling through too much vanilla fantasy, flip this open, insert a hex’s critters/magic-users, there you go. When used (and read) in small doses, this is phenomenal. However, if you want to use the book in its entirety, you will run afoul of a lot of the issues I noted and I’d honestly be surprised if you could run this as written without at least trying to add some sort of mystic rules, some sort of meta-structure and sense underlying the proceedings. Without it, the coat of weirdness peels off quickly, making the per se cool prose feel random, the whole isle static. There are a couple of monuments that tie in with other creatures. How? Why? No idea. These few and far in-between instances feel almost like afterthoughts, excuses made up by the referee while running the game. Smashing a gem will banish a certain critter. Okay, why? No idea. 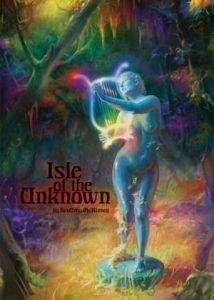 I began reading Geoffrey McKinney’s book and felt like my mind had been blown – more so than even Carcosa, I absolutely loved it, I actually dreamed of the isle and its wondrous places…and then, unlike Carcosa, that love turned somewhat sour. I only realized that when a gaunt, gigantic panda with a poisonous stinger elicited but a shrug from me; at that point, I had read about 80 pages of this brand of weirdness and had become numb to it. What this book needed, desperately, was more tricks, different kinds of strange, structure – anything to ground the amazing concepts. As written, I crashed harder from loving the book to being disillusioned by it than in any comparable book I’ve read. How to rate this, then? Well, when I began reading this book, I was blown away and wanted to bestow my highest accolades upon it; having finished the book, I honestly can’t see me ever picking it back up, short of throwing some weirdness at my PCs when I didn’t have the time to prepare something. This is not a bad book, quite the opposite; its gorgeous artworks may make it worth for you…but in the end, I couldn’t help but feel like the lavish production values are here to help conceal the lack of depth that represents the main shortcoming of this book. If you’re looking for a book as a scavenging ground of the strange and wondrous, then this is very much worth getting; for other uses…well, not so much. Ultimately, I consider this book a mixed bag, slightly on the positive side. However, try as I might, I can’t bring myself to round up from my final verdict of 3.5 stars – I’m frankly too disenfranchised with what could have been a book for the ages. You can get the pdf here on OBS! You can get the print version here on LotFP’s store! This Everyman Mini clocks in at 11 pages, 1 page front cover, 1 page editorial, 5 pages of SRD, 1 page advertisement, leaving us with 3 pages of content, so let’s take a look! So, what do the options herein do? Basically, we get archetypes that modify the black blade (a deservedly popular choice) gained by e.g. the bladebound magus archetype. Since they are archetypes, they must be taken as whole packages – analogue to regular archetypes, there’ll be no cherry-picking here. 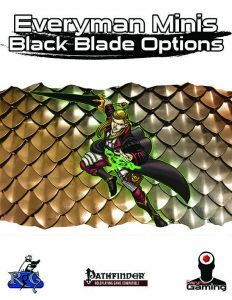 Okay, so, before we take a look at the archetypes in question, it should be noted that the pdf also sports two new magus arcana: Black Blade Endowment lets the magus spend points from his black blade’s arcane pool to add a selection of special weapon properties to the black blade. This consumes an amount of bonus equal to the property’s base price modifier. The bonuses persist for as long as you don’t reuse the ability. Okay, I am pretty sure that a line went missing at one point: As written, it looks like the ability consumes the black blade’s enhancement bonus temporarily, acting as a cap to e.g. prevent low-level vorpal, which is good – however, the arcana fails to note how much arcane points the enhancement costs. I assume that the cost in arcana points is equal to the base price modifier of the properties. But then again, is it intentional that you could recover the arcane pool points while retaining your current, favored combination? The arcana should really spell out not only that you need to spend points (it does that), but also how many. Oookay, number 2 would be Learned Blade, which nets you Breadth of Knowledge while wielding the blade. The pdf contains a total of 3 different black blade archetypes – the first would be the ancestral blade, who gets mental attributes equal to 10 +1/2 the magus’s level, with an ego of 10 at 3rd level that increases by 3 every 3 levels thereafter. These blades gain 2 skill points per HD of the magus and treat skills based on the mental attributes as class skills. It may only use them within its given sense-reach. However, the magus determines the enhancement bonus at -3 levels. Below 2nd level or less, the magus may not apply the enhancement bonus on weapon damage rolls. At 5th level, the blade’s senses reach to 30 ft. with both low-light and darkvision. 9th level extends that to 60 ft. and grants the ability to speak and understand all the magus’s languages. 13th level increases this by a further +30 ft. and adds read magic; 17th by a further 30 ft. – and also unlocks blindsense 30 ft. This replaces energy attunement. The second archetype would be the dragonsoul blade – you choose one dragon from a massive table that includes esoteric, primal, imperial and outer dragons alongside the classics. This determines the damage type that the altered energy attunement works with: At 5th level, the magus can spend 1 point from his blade’s arcane pool to alter the damage of the blade to the type associated with the dragon. No, umbral dragon based blades, who gain negative energy, cannot heal undead by whacking them – nice catch! The dragon chosen also determines the 13th level ability – the magus can point the blade at a foe to generate a breath weapon of sorts for 1 arcane point from the blade’s pool, with a 1d4 cooldown. This replaces transfer arcana. 19th level yields a 1/day form of the (exotic/alien) dragon III with additional uses costing 3 points – minor complaint: While it’s easy to default to a standard action for the Su, it would have been cleaner if the ability stated its activation action. This replaces life drinker. The final one would be the levialogian blade (after the amazing monsters introduced in Paranormal Adventures), who must be evil. The blade is hungry, and to gain any powers from it, the master must feed it the equivalent of 1 point of Constitution damage of his body’s flesh per day. The blade has 3 + its Int-mod arcane pool points and at 3rd level, is symbiotically linked to the magus. As a swift action, the magus may sheathe his blade in his own body. He may similarly draw it quickly and somewhat grotesquely. Losing the blade lets the magus regrow it in a special ritual. This replaces unbreakable and Alertness. At 5th level, as a free action, the magus can spend a point from his blade’s pool to cause it to erupt in screaming, gnashing maws – think “Soul Edge.” This Makes the weapon cause bludgeoning, piercing and slashing damage and ignore DR and hardness for the attack. If used to sunder, this adds +1 to the sunder check for every 3 magus levels of the wielder. This effect only applies to the next attack made or until the end of the magus’ turn. Love the visuals here, but don’t like the DR/hardness-ignoring – a scaling decrease of the two would have imho been more elegant. Instead of teleport blade, 9th level allows the magus to spend 1 point of the levialogian blade’s pool to change its weapon type as though it was a transformative weapon – any light or one-handed weapon is game, even bludgeoning weapons. Editing and formatting are very good on a formal level; on a rules-language level, a couple of minor hiccups have crept into the designs here. Layout adheres to Everyman gaming’s two-column full-color standard and is pretty printer-friendly. The artwork featured is nice and, as always, the pdf has no bookmarks, but needs none at this length. I really adore the visuals and concepts of 2 of the three archetypes herein – and the third one is nice as well. I really like the customization options they offer. At the same time, I did stumble over one minor oversight and one bigger, rules-relevant hiccup and I’m not perfectly sold on the blade of maws’ DR/hardness-ignoring properties. Still, in spite of these complaints, I consider Alexander Augunas’ black blade options well worth checking out – they are unique and pretty cool – dragonsoul and levialogian blade in particular just beg to be used as high-concept options. In the end, my final verdict will hence clock in at 4 stars. You can get these variant black blades here on OBS! This hybrid class clocks in at 25 pages, 1 page front cover, 1 page editorial, 2 pages of SRD, leaving us with 21 pages of content. It should be noted that the text is laid-out for digest/booklet-size (A5/6’’ by 9’’). The abomination as depicted herein would be a hybrid of unchained barbarian and unchained summoner. The class gains d12 HD, 4 + Int skills per level, full BAB-progression, good Fort- and Ref-saves and a natural armor bonus that increases from +0 at 1st level to +8 at 20th level. The abomination only gains proficiency with two simple weapons of his choice as well as with light armor. Spellcasting is handled via SPs – the abomination begins play with a spell-like ability drawn from the unchained summoner’s spell-list. At 4th level, 6th level and every 3 levels thereafter, the abomination receives an additional spell-like ability. Restriction-wise, the abomination’s class level must be at least twice the spell level to be selected as SP to make it eligible – it thus takes 6 class levels to choose a 3rd level SP. These SPs are governed by Charisma and may be employed 3/day; exception to this rule would be 0-level SPs – such SPs can instead be used at-will. Now, summoner spells often influence eidolons in specific way – in a nice bit of service, these spells don’t just fall by the wayside; instead, we cover a couple of them, highlighting how they interact and work – life conduit, for example, can be rather risky. Still, I actually liked this aspect about the presentation of the class – it shows care. Now, unsurprisingly, the abomination also gains an evolution pool: We start with 1 point and increase that to up to 8. These evolutions are per se fixed, but may be changed upon gaining a level or by being transmogrify-d. The abomination does receive a rage-variant, the rampage. This one can be maintained for 4 + Constitution modifier rounds, +2 per class level. Temporary increases in Con do not grant additional rounds. The abomination gains +1 to Atk with melee attacks, +1 to melee and thrown weapon damage rolls and Will-saves, as well as -1 AC and 1 temporary hit point per HD. After a rampage, the abomination is shaken and the ability is treated as rage for the purpose of prerequisites, etc. Now personally, I would have loved to see a caveat that precludes characters immune to the shaken condition for rampage-cycling here. On the plus-side: The 17th level ability eliminates the shaken-cooldown, but does not yield temporary hit points again if trying to re-enter the rampage before 1 minute has elapsed. The bonuses rampage grants are upgraded to +2 and 2 temporary hit points per HD at 11th level, +3 and 3 temporary hit points per HD at 20th level. At 2nd level, we get uncanny dodge and evasion; 5th level provides improved uncanny dodge and 7th level nets DR 1/-, which improves every 3 levels thereafter. 14th level nets improved evasion. Now thankfully, the abomination does not gain free access to all evolutions – instead, the class gets its own custom list, which thankfully do clarify the respective natural weapon interaction. That being said, there is a bit of an oversight, convenience-wise: the natural attacks tend to list their damage values for Large abominations – but not for Small ones. Probably a heritage issue left over from the eidolon-translation. Not a big deal, but inconvenient nonetheless. Big plus among the 1-point evolutions: They don’t break game-assumptions à la low level personal flight etc. ; on the downside, there are a couple of choices that can be a bit weird in play: It is, for example, possible to give yourself pincers…but RAW, you don’t have issues tying your laces, holding those lockpicks – you get the idea. It’s not a big issue, mind you: As Limbs is a 2-point evolution, you can easily do the glabrezu and have a second pair of pincer arms (no, you don’t get additional attacks), but yeah – there are a couple of evolutions, where a bit more PC (as opposed to pet-function)-functionality/explanation would have been cool. Know how I commented on how the 1-point evolutions don’t break low-level assumptions? Well, it is my pleasure to report that both e.g. elemental bonus damage and unassisted flight are locked behind 5th level; similarly, the powerful rake and rend options are locked behind 4th and 6th level, respectively. The nature of the natural attacks required for them further provide limiting factors here. Nice: The 3-pt.-evolutions include e.g. Wisdom damage causing consciousness (with sanity alternatives for Horror Adventures! ); infinite, but slow fast healing is locked behind 11th level – not the biggest fan there, but yeah. It should also be noted that 8th level nets a monster feat – the abomination must meet the prerequisites, thankfully, but may choose to lose and replace this feat upon gaining a new level. The pdf also provides new feats: +4 rounds of rampage, +1 evolution pool (which may be taken more often, with 5th level and every 5 levels thereafter as extended prereqs). The monster feats provided, Aberrant Creature and Determined Spell-like Ability, both made me cringe a bit – the latter lets you roll 1d20 upon using a SP – on a 15+, you don’t expend it, with 8th level and every 4 levels thereafter yielding you a +1 bonus to the roll. Yeah, I wouldn’t allow that anywhere close to player hands. Aberrant Creature sports this gem “You are now classified as aberrant in creature type.“ as part of its rules-text. Rules-language, this is not, young padawan. The pdf does contain one archetype, the mire champion, who gains bonus languages, adds Knowledge (nature) to the list of class skills and draw their spells from the druid spell list, using the unchained summoner spells known charts. The archetype sports this puzzling sentence “Mire champions gain bonus spells and adjust saving throws using their Wisdom score and its modifiers. They are thus classified as ‘spontaneous casters’“ – that’s not how you designate prepared or spontaneous spellcasters; the saving throw bit is confusing at best and, newsflash, Wisdom-based casters are more often prepared spellcasters than spontaneous ones. Just as an aesthetic aside. The whole defensive array of abilities is replaces with fast healing while in contact with soil (sans limits – urgh, but works only sans armor) and the archetype replaces the 8th level monster feat with constant speak with plants. Not a fan of this archetype – it feels rushed in more ways than one. We get a metric ton of favored class options for Porphyran races, which is pretty neat – however, the +1/4 evolution pool options are significantly better than the others; I am also not the biggest fan of the crit-confirmation-boosts with natural weapons, though at least the non-stacking caveat with Critical Focus there does help a bit. The pdf comes with a nice little bonus file – the Dragon mite, penned by Perry Fehr, which represents a CR 1/3 Diminutive vermin that infest dragons! Yep, dragon parasites! The cranky dragon actually has a reason to recruit the PCs, as they delouse the creature from its potent, energy-blasting mites! Oh, and guess what? We get a cool dinosaur variant as well. These don’t have the energy shenanigans, but do inflict salmonella…ew! Editing and formatting are very good on a formal level – the rules-language, for the most part, is concise and clean; while I would have liked to see a couple more prereqs/interaction elaborations here and there, the presentation per se is solid. Layout adheres to Purple Duck Games’ 1-column standard, is printer-friendly and comes with purple highlights. The artworks for the class and the bonus critter are in full-color and rather neat. The pdf, strangely, doesn’t sport bookmarks, which represents a minor comfort detriment. 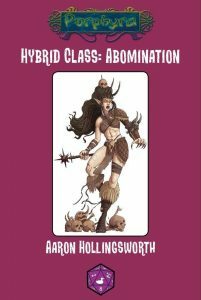 I enjoyed Aaron Hollingworth’s abomination more than I thought I would. I have seen quite a few evolution-based shifter-classes and this one’s focus is sufficiently distinct to make it stand out…a bit. You see, this may just be me, but after having played Darkest Dungeon, I did kinda hope that this would be a two-mode class; you know, with rampage tying in with the evolutions. As written, the components of the class, while not bad, are pretty static. It would have imho been more interesting to provide ability suite a) in normal mode, ability suite b) in rampage mode. But that’s just an opinion and will not influence the final verdict. Similarly, I think that going full-blown horror-adventures with the fear-rules, sanity etc. could have yielded a thoroughly compelling, unique engine here, one that would have set the class more distinctly apart from its brethren. What will influence it, though, would be the sudden drop in rules-language integrity when it comes to archetype and feats, which frankly struck me as puzzling. That being said, the damn cool bonus critter does make up for those shortcomings, at least to an extent. Hence, my final verdict will clock in at 3.5 stars, rounded up due to in dubio pro reo. You can get this nice hybrid here on OBS! This brief pdf clocks in at 8 pages, 1 page front cover, 1 page SRD, leaving us with 6 pages of content, so let’s take a look! So, there is some merit to playing kids. For one, if your players ARE kids, it may make sense to start playing as kids and then transition to adult adventurers after e.g. a “formative” adventure in youth; similarly, adult adventurers turned into kids can be a nice change of pace. In PFRPG, the massive toolkit “Childhood Adventures” makes for a great way to depict all the eventualities, but at least to my knowledge, no such toolkit exists for 5e…apart from this one. Now, before we start, it should be noted that the focus here is strictly on the “start playing as kids”/formative adventure-angle; everything beyond that is beyond the scope of this pdf. It costs $1.00. What did you expect? So, how does this pdf go about codifying kids? We begin with a child creation outline: The book knows three age categories: Infant (which you won’t play), young child and adolescent. The pdf recommends point buy for stats and advises to not have a kid buy a stat higher than 12 before modifications: Young children get 7 points, adolescents 14. Alternatively, one ability score array for young children and adolescents can be found. Children, as depicted here, do not have a class. Instead, they have 4 + Con/racial modifier hit points, AC 10+ Dex-mod, initiative 0 + Dex mad and saves equal to 0 + related ability/racial modifiers. Human and elven kids have a speed of 20 feet, dwarves 15 ft. Okay, I *assume* that, analogue, Halflings and Gnomes also should have a 15 ft. speed, while half-orcs, tieflings etc. also have a speed of 20 ft. – unfortunately, the pdf needs you to extrapolate these values – slightly inconvenient. Now, granted, the pdf does clarify that later, but not in the first summary of the basics. We do get a big adjusted height and weight-table, which is nice. The pdf then proceeds to list universal child adjustments: This notes “Speed: 10 ft.” – considering the formula, I am pretty sure a minus is missing here. Darkvision is halved for young children, while adolescents get full darkvision. Language-wise, young kids get the racial tongue, adolescents a secondary language. Young children have no proficiency bonus, while adolescents have a +1 proficiency bonus. Dragonborn are a special case – they get their draconic ancestry and damage resistance as the adult. Their breath weapon comes in two versions. Weird: Young children have a 1d4-2 5 ft.-range breath weapon that recharges every 1d6 minutes. I get the flame-burp-joke, but since that’s less than at higher age…it felt weird to me. A handy table lists the racial stat bonuses for young children (usually one +2 and one +1; exceptions: Half-elf gains +1 to any three, humans +2 to one stat – though these gain +1 proficiency bonus) and abilities based on race: Lightfoot Halflings get lucky and naturally stealthy, for example. The second table lists them for adolescents – all races get +1 to all stats and some further abilities. Now, here is something that’s a bit weird. Some young children gain proficiency bonus +1; adolescents gain proficiency bonus +1. It feels strange to me that their advantage in development is lost upon reaching adulthood. The pdf does provide some general notion of the idea of playing kids long-term, suggesting 2 to 3 ability score gains per level. We close with stats for rats and spiders – challenge 0 threats that net 10 XP. Editing and formatting are good; while I noticed a few aesthetic hiccups like missing blank spaces and dots, nothing serious. Layout adheres to Tribality Publishing’s nice two-column full-color standard with photographs of toys etc. as artwork – works rather nicely! The pdf has no bookmarks, which, at this brief length, constitutes a minor comfort-detriment. Alton Bailey and Ralph Clark have provided an unpretentious, handy little booklet. It doesn’t reinvent the wheel, it doesn’t provide a massive, exhaustive campaign toolkit, but it works rather well for its intended purpose – if you e.g. want to go a route similar to “Tales of Graces F” and start with childhood hijinxs, then this should have you covered. For the low and fair price point, this is worth checking out. My final verdict will clock in at 4 stars. You can directly support Tribality Publishing here on patreon!